A reminder that Wednesday was a rest day, so after Tuesdays first day of four quarter championship matches - today saw the 2nd batch of four quarter games. The report below again provided by Ben Drew AFL South Pacific Development Manager. Wednesday was a rest day and at 8:30am teams were sent to the Damadoor Aquatic centre for recovery session with Michael Hyndman from AFLQLD, the teams were then dropped off to Albert Park and taken through Social Media & Respect & Responsibility workshops. From 1pm Andrew Hughes from the AFL gathered all the coaches and took them through a coaching masterclass session. A solid mark for Nauru. Match Results From Day 3 of the Oceania Cup in Suva, Fiji. This was the conclusion of the round robin matches with Grand Finals set for Friday afternoon at 1pm & 2pm. Game 4: Fiji Defeated Tonga in a tight contest. The Fijians were on top all day but the Tongans fought back late a terrific 50m goal from Inesi to send a scare through the Fijian team. In the end Fiji were able to hold on to a 3 goal victory. The match was fierce with tackling pressure up and no space available in the contest. Both teams were terrific and ran the game out well after the day off yesterday. Game 5: The scoreboard didn't show the true reflection of the match, the Solomon Islands had plenty of opportunities to score but were wayward in their kicking for goal and the Nauruans were excellent in getting back in defence. 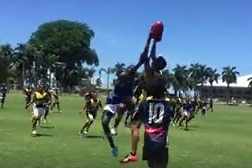 In the end Nauru registered a comfortable win to send them into tomorrow Grand Final. Their skills and ball movement stood out as they transferred the ball from Half back and finished their hard work with goals! 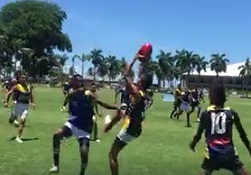 The Solomon Islands boys played really well and never gave up. 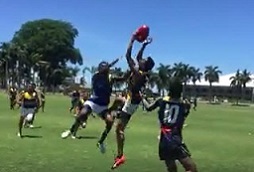 Game 6: This game was close all day but as the Solomon Islands boys got tired the Fijian fresher legs took over and they kicked 4 goals in the last quarter to seal their victory. The game was played at a frantic pace with the ball going up and down the ground with ease. Big tackles and fast legs took over the game! The final score doesn't show the true reflection of how well the Solomon Islands boys played.